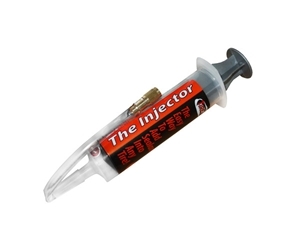 The Injector is easy to use enabling anyone to add sealant quicker and with no mess. Deflate the tire and remove the valve core. Next, thread The Injector tip straight onto the valve stem. Pour in the correct dosage amount and Inject. It's that easy to use, make sure to re-inflate tire and rotate the tire to allow tire sealant to fully coat.